You want to convert my mod(s) to SSE Skyrim Special Edition ? Go for it. Don't even need to ask me. Although be sure to properly copy-paste the credits tab in your mod page. Here is the complete list of all the images I have used for this mod. Big thanks to them. The cards wouldn't look as cool or as interesting without them. Added the Bucky The Becket booster pack (20 cards), courtesy TheFurCrew. Big thanks to him :D ! 39 new cards themed after the Children Of Skyrim. Thanks neab ! Lore buffs, treasure hunters and collectors of all curiosities : BEHOLD ! 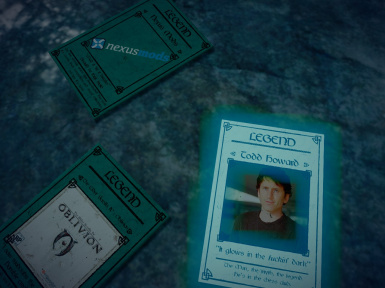 This mod adds collectibles card to Skyrim. 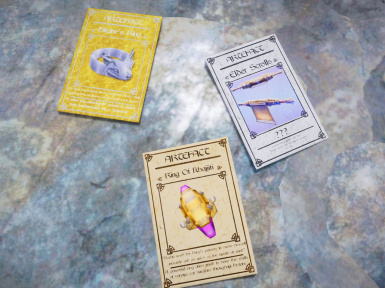 These cards can be found on enemies, in chests, in merchants inventory, at book sellers and generally everywhere books normally spawns. 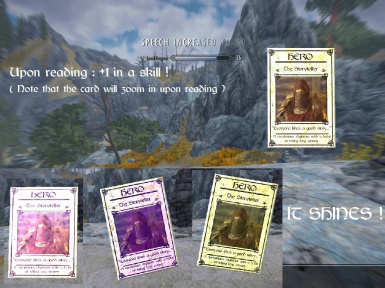 The main goal of these card is to teach the player general knowledge about the lore of The Elder Scrolls universe, in a fun and "dynamic" way. Each card you find has a picture, a quote and a description of what it's picturing. SKYRIM - These cards are black. They are all about things you can find, see, talk to or slay in The Elder Scrolls V : Skyrim. DAWNGUARD - These cards are red. They picture things you may have seen in The Elder Scrolls V : Dawnguard DLC. 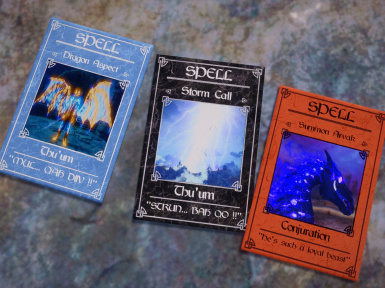 DRAGONBORN - Blue cards. All about the content of The Elder Scrolls V : Dragonborn DLC. 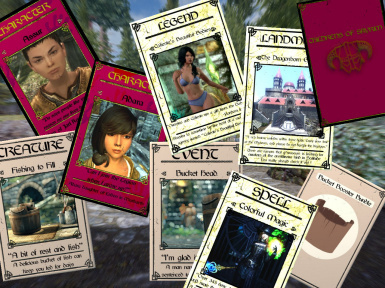 OBLIVION - As the title suggest, these brown cards will take you to nostalgia lane and teach you a thing or two about The Elder Scrolls IV : Oblivion and all its minor add-ons. SHIVERING ISLES - Orange and Purple cards depicting things you may have witnessed in the add-on for Oblivion : Shivering Isles. MORROWIND - Still not nostalgic enough ? These yellow cards have you covered with content from The Elder Scrolls III : Morrowind and all its add-ons. LEGACY - These white cards with black font are related to general lore of the Elder Scrolls universe. Gods, races, continents, all of it ! 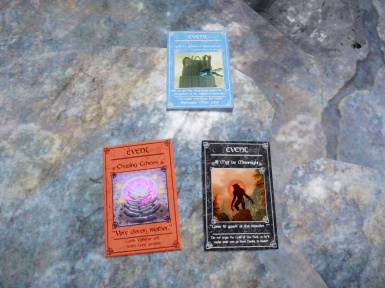 META - Mysterious ( and very rare ) green cards that hold knowledge about things outside of the Elder Scrolls universe. Very Easter-eggy. 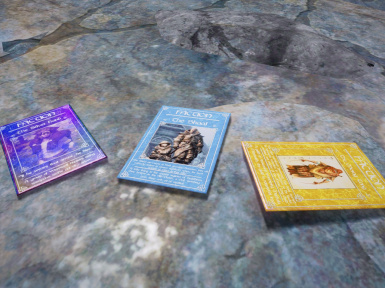 NEXUS - Brownish cards that depict the great heroes and legend of Tamriel. ( Used to depict great figures of The Elder Scrolls Community and maybe even YOUR character ). 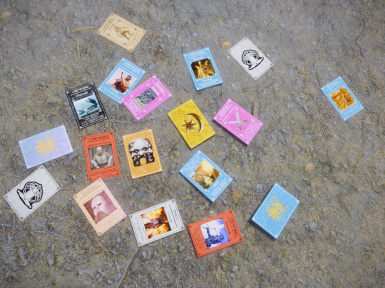 CHILDREN - Kindly donated by neab these cards represents the children of Skyrim and Solstheim, as they appear in the mod The Kids Are Alright. 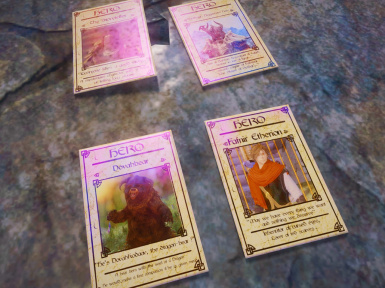 Bucky The Bucket Booster Pack - Kindly donated by TheFurCrew, these cards are all about the beautiful buckets found all over Skyrim. Among these cards, you may find elusive RARE cards. These magic items will grand you a bonus point in certain skills upon looking at it. I also recommend Reading Is Good by Parapets. That mod overhauls the skill book system : instead of adding a skill point to your skill when reading skill books, you'll instead gain a permanent speed boost in increasing that skill, akin to the "well-rested" ability, but only for a single skill and it'll last indefinitely. My Rare Cards are even more interesting with that mod installed ! Want to participate in this mod's expansion ? YOU CAN ! Take a screenshot of... well, just about everything and send it to me ! It can even be your character ! just explain his/her backstory to me with a small quotation of what the character says and I'll turn it into a card ;) ! Big thanks to TheFurCrew who nicely gave me 20 cards, themed after... buckets ! Available from 2.0 onward. For giving me a Nexus Mods PR Pack with all the goodies I needed to improve the Nexus Mods-related cards. He deserve a big hug ! For the 39 cards themed after the Children Of Skyrim. Thanks to him :D ! (Available from 2.0 onward). Where can I find the cards ? Why is the mod so large ? ﻿The Creation Kit wouldn't let me apply custom textures on the "readable" mesh. So I had to create a readable mesh for EVERY. SINGLE. CARD. Also, 170 1k textures files is quite large anyways. Is this mod incompatible with X or Y ? ﻿This mod *should* be compatible with just about everything. It edits some leveled list so be sure to load it at the lowest possible emplacement of your load order. Where can I send you my would-be custom card ? ﻿You can upload your screenshot to the Nexus images and send me a message, for example. Or you can send it to me at [email protected] . ( If you do, shoot me a message on the Nexus, just in case ). Please note that I also included every base template I used in the file. If case you want to make your own cards. The correct font is Cyrodiil Font, found here. The Credits Tabs contains the source of every. single. image used from the Nexus. Go check them out. They make some cool desktop background. All the images are either from the Nexus, official promotional images and concept art by Bethesda, images send to me by users or are screenshots taken by me. If anyone wants to convert this mod to SSE, they can without asking. All I'm demanding is that the credited assets are properly... credited. I'll try to take a look and learn how to convert SLE mods to SSE if the demand is high enough. Although, I can't guarantee my success in doing so.